Headed to the radio station this morning for a show on Afro-Cuban music. Perhaps I should say Afro-Latin, since I plan to include a track from this Haitian re-issue as well. You can listen to the show via the KAOS webstream, and you can listen to a track from Haiti's Tabou Combo right here. Enjoy. Formed in 1967 just outside of Port-au-Prince, Tabou Combo has proven to be the most successful band to ever come out of Haiti. They’ve toured Europe, Mexico, Africa, the Caribbean and the United States (including a central Park concert boasting over 20,000 attendees). It has been said by many that Tabou Combo is Haitian music. Their unique blend of American funk and soul with native sounds has earned them legions of devoted fans the world over. However, their popularity didn’t exactly occur overnight. In fact, after a couple years of playing around Haiti the group disbanded and went their separate ways. Most of the members settled down in different parts of the US. 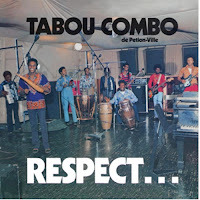 By late 1971 Tabou Combo reformed in Brooklyn, NY. It wasn’t until 1975 that they scored their first real hit, though. But, that time between ’71 and ’75 is when some of their most exciting and experimental music was created. The most notable of which was 1973’s Respect… LP. The album is true to their roots as a Compas (Haitian party music) band. Rather than play American pop music with flavors of Haitian music, they focused their sound on Compas and used funk, soul, and psych as extra spice. All of the songs are sung in Haitian Creole, with the exception of a couple ballads that are performed in French (a common practice in Haiti at the time). The intricate guitars drenched in psychedelic effects fuse seamlessly with non-stop hard driving percussion to create one of the most hypnotic, unique sounds ever recorded. Couple that with the mix of Caribbean rhythms and danceable James Brown inspired breaks and you will hear why Respect… is among the most collectable world music records of all time.